The destruction of affordable housing within the City of Los Angeles is unmistakable as our interactive map and graphic reveal. The California Legislature adopted the Ellis Act in 1985 after the California Supreme Court ruled that landlords do not have the right to evict tenants to go out of the rental business. It was originally passed to protect "mom and pop" landlords who could no longer tend to their rental property. But, the intent of the Ellis Act has been corrupted by large developer whose sole objective is to acquire rent control housing, destroy it, evict tenants and replace the existing housing with high-priced luxury housing. Studies have documented that many of the Ellis Act evictions are being done by developers who have owned the property less than a year. The Ellis Act has resulted in the loss of tens of thousands of affordable rent control units, the gentrification of neighborhoods, and the displacement of tenants throughout California. There is a great need to build new affordable housing. At the same time we must preserve our existing affordable housing stock. Unless decision-makers understand that we need to do both, preserve and produce, we will be doomed to a failed housing policy and our crisis will get worse. The Ellis Act is one of the greatest impediments to addressing our affordable housing needs. The Ellis Act Must Go! The City of Los Angeles saw 997 more Ellis Act Eviction application filed by landlords and developers for the first half of 2018, January through June. This is the equivalent of losing nearly 5 1/2 Rent Stabilization Ordinance (RSO) units a day in 2018. This brings the total of Los Angeles Rent Controlled affordable units lost since 2001 to an astounding 24,021 units! 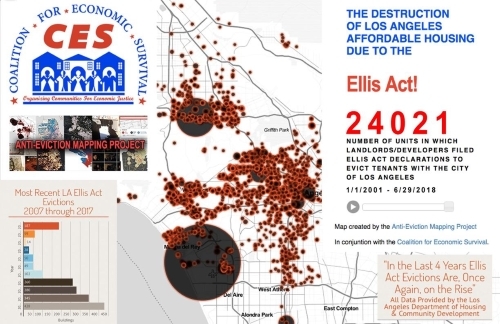 The Coalition for Economic Survival (CES), in conjunction with the San Francisco-based Anti-Eviction Mapping Project, is releasing an update of our web-based interaction map, showing where 24,021 rent stabilized affordable units have been destroyed in the City of LA from 2001 through June 30, 2018 due to the Ellis Act. The Ellis Act, a state law passed in 1985, which undermines local rent control laws, provides landlords the ability to evict tenants in order to remove housing units from the rental market. We can no longer allow developers to go into communities and just bulldoze them to put up high-priced luxury housing. Because, if this continues, next time around there will be another initiative, which will deal with these issues directly, and it will gather more support. Limit how many times a year a developer can use the Ellis Act. Provide all tenants, regardless of age or family status, with a one-year notice of eviction.